Aishwarya Rai has chosen 'Pixie Dust' in golden and silver that costs around ₹ 2,990 from the house of Fizzy Goblet, a favorite of celebs. Janhvi Kapoor has chosen Hello Sunshine costing around ₹ 3,200 from Fizzy Goblet to go with her pink and yellow salwar kameez. The entire look is simply perfect. Kangana Ranaut looked attractive in a white ensemble and belle rose ivory juttis which cost Rs. 3,290. This is a perfect outfit for a night out with your loved one. 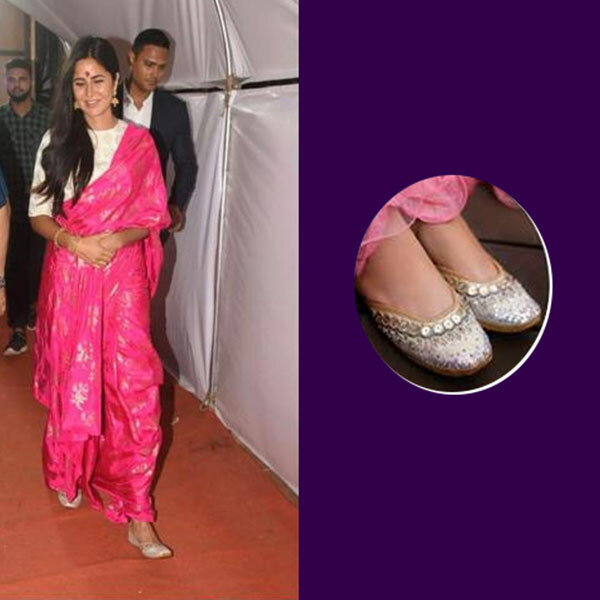 Katrina Kaif looked gorgeous as she opted for a pixie dust - Silver & Gold juttis costing Rs. 2, 290 to go with her pink saree. You will be the cynosure of all eyes if you opt for such look. Kriti Sanon in a shimmery white saree with moonbeam silver juttis costing Rs. 2, 990 is just the thing you need for your cousin's wedding. Shilpa Shetty went for pomegranate passion juttis costing around Rs. 2,900 with her fusion saree look and the whole effect was stunning. A perfect dress for that fun time with friends. Sonam Kapoor's royal blue lehenga with mirror gold juttis from Fizzy Goblet is perfect for a dandiya night.